This project matured over five years, from our first exploratory flute improvisations, and through sharing and experimenting with arrangements of each other’s songs, to this finished suite of pieces. Our collaboration grew from our shared love for traditional flute music, and for songs of Earth and Spirit. The album is a dance between the ancient Japanese shakuhachi flute and the Native American style flute, woven together with songs of the elements. A musical journey that moves between the simplicity and spaciousness of the flute melodies, to the intricacy of the songs that dive deep into the roots of humanity and soar high with the flight of the eagle. 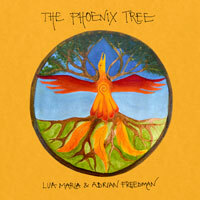 Lua Maria sings and plays Native American style flute, guitar, charango and frame drum. Adrian Freedman plays Japanese shakuachi flute, guitar, harmonium, frame drum, shakers and temple bells. “I grew up in the devon hills. My music comes from a place of love and connection with nature. Usually the songs come to me as I wander the hills and valleys listening for the songs of the wind, rivers and trees. For me, to sing is to pray and to give thanks to life. Music can be a powerful medicine, connecting us back to our truth, our roots and our Mother Earth. This song came to me as I ran though the Devon fields, swam in the river and rested by the ancient Oaks. I am in wonder at these beautiful trees, standing in one place for hundreds of years. Slowly growing, silently witnessing. This song is in honour of these wise beings, with whom I learned much about stillness and inner strength even in the times when I do not know what the next step is or where the river of life is taking me. This song came from a place of darkness. Travelling the worlds of my inner landscapes, of heartbreak, ancient wounds and vulnerability, and the harvest that is reaped from living through challenges and saying yes to what life brings. Even I did not really understand the meaning of this song, as it arrived in one cascading waterfall in the deep of a winter night. Years later the full meaning revealed itself to me. I wrote this song in the wild hills of La Palma, Canary Islands. It is a call to the Grandmother Eagle to guide us in her Wise Way to live on Earth with Clear Vision, in Hamony and Unity. At a time of deep crisis in my life, when I needed to find a core of inner light in order to survive, this song arose in the middle of the night, opening like a lotus flower through dark waters of the soul. So beautiful to hear the melody sung by Lua. Lua plays Native American style flutes designed by Dartmoor flute-maker and musician Nigel Shaw. The instruments are individually hand-carved from timber local to Dartmoor. Nigel made the Cedar drone flute, and helped Lua make the Silver Birch flute. Lua’s frame drum is made from Dartmoor deerhide by Dorrie Joy. Adrian plays shakuhachi flutes made my Miura Ryuho and John Kaizan Neptune.